According a report released by the Joint Center for Housing Studies of Harvard University, rental demand has increased dramatically in the past 10 years. The study found that the U.S. saw its largest gain in any 10-year period from the time between 2005 and 2015, when rentership skyrocketed from 9 million to 43 families. 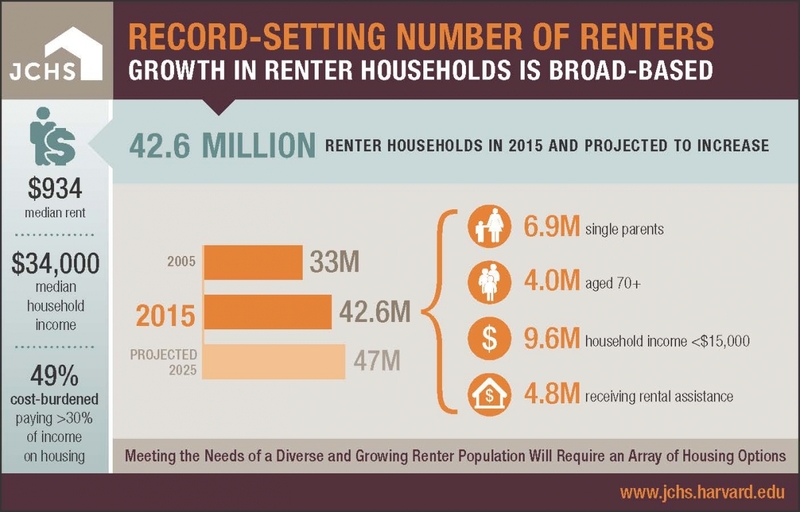 Renting is at its highest rate since the 1960s. Households with incomes of $100,000 or higher represented 18 percent of rentership growth between 2005 and 2015, or 1.6 million renters. Households between $25,000 and $99,999 represented 38 percent of growth, or 3.4 million renters, and those with an income of less than $25,000 grew by 45 percent, or 4 million. The largest pool of renters, 55 percent, was among the baby boomer generation, 34 percent among gen-x and 11 percent among millennials. In Washington, D.C., the share of moderately cost-burden renters in 2014 was 19.9 percent and the share of severely burden renters was 26.1 percent. In the entire Washington-Arlington-Alexandria metro area, 47.2 percent of renters are cost-burden. Interactive map provided by the Harvard Joint Center for Housing Studies.